Figure 1. Sidedress fertilizer and N stabilizer application. Right place: fertilizer placement that optimizes the crop's ability to use it. The four R's address management considerations (e.g. fertilizer program, irrigation), but site characteristics (e.g. soil, cropping system, weather conditions) also influence N recovery in the crop. Also important to improving crop N recovery is understanding barriers to adopting best management practices, such as costs or risks to crop quality or yield. While the four R's articulate four principles for N management, the N cycle in cropping systems is complicated. Nitrogen can be introduced and lost by various paths. We generally add N with organic matter amendments – such as crop residues, compost, or manure – or with fertilizer. While organic matter amendments must be mineralized before the N is available for plant uptake, fertilizer N is readily available for plants to use. That said, plants generally take up N at different stages during their life cycle, and there is a risk for N loss if the N is applied or becomes available when the plants do not need it. Technologies have been developed to mitigate N losses from cropping systems. These technologies are collectively known as enhanced efficiency fertilizers (EFF) and include additives, physical barriers, and chemical formulations that stop, slow down, or decrease fertilizer losses. Nitrogen stabilizers are one example and are fertilizer additives intended to improve crop N use efficiency and reduce N losses to the environment by interrupting the microbial processes that change N to its plant-available forms. We developed a trial to evaluate two N stabilizer products with the objective of determining whether the treatments improved corn silage yield or plant N status compared to fertilizer alone. We did not attempt to measure N losses from the system (e.g. leaching, denitrification), as these are very challenging to quantify. 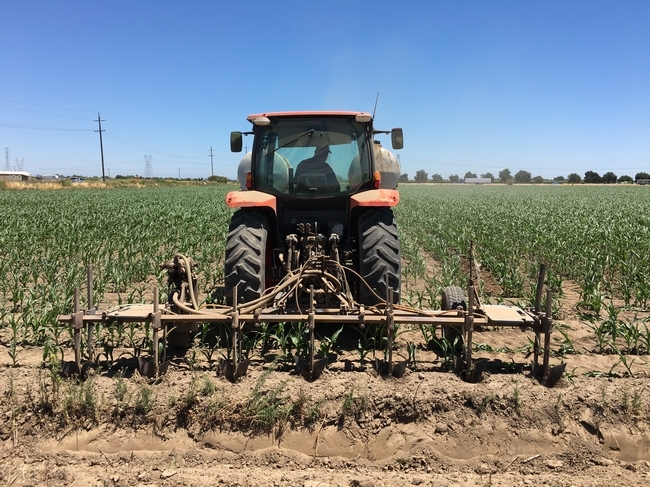 The trial took place in San Joaquin County on a DeVries sandy loam soil. A description of the methods can be found in the full report. 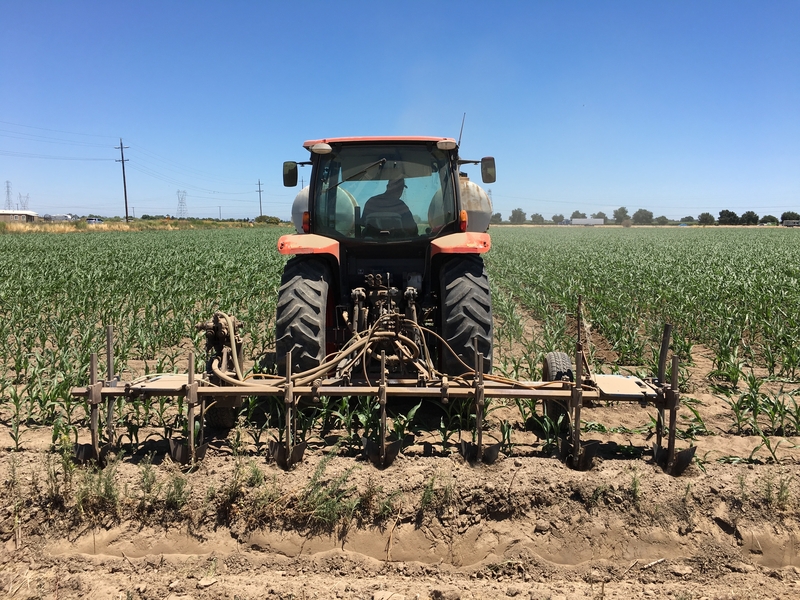 Sidedress fertilizer application occurred on June 21, 2018 and provided approximately 105 lbs N per acre (UAN 32). Four treatments were applied at sidedress, when plants were at V3-4 stage of development (Figure 1). The N stabilizers were applied at the label rates, and the treatments were: 1) Vindicate (Corteva Agriscience) at 35 fluid ounces per acre, 2) Agrotain Plus (Koch Agronomic Services) at 3 pounds per acre, 3) combination of Vindicate and Agrotain Plus at aforementioned rates, and 4) fertilizer-only, no stabilizer product (“untreated”). Treatments were randomly applied in three replicate blocks. Aside from the treatments, the trial was managed by the grower in the same manner as the field. We evaluated soil N status, plant N status, and silage yield. Soil results are available in the full report. There were no statistically significant differences in plant N status or yield (Table 1). Mid-season (i.e. silking, R1) leaf N averaged 2.88 percent across treatments, and aboveground biomass N at harvest averaged 1.12 percent. At mid-season, leaf N from 2.7 to 3.5 percent indicates that the plant had sufficient N to carry the crop to harvest, and at harvest, aboveground biomass N from 1.0 to 1.2 percent indicates that the N fertilization program was adequate for maximizing yield. Thus, it appears that the trial was not deficient in N. Calculated to 30 percent dry matter, average yield across treatments was 38.8 tons/acre, and dry matter was 35 percent. There was a trend for the two treatments with Vindicate to have higher N removed than the two treatments without it, but the difference was not statistically significant. In summary, N is part of a balanced, natural cycle in the environment and is the most important nutrient in cropping systems. Giving consideration to N management will help ensure that a greater fraction of the applied N is recovered in the harvested crop and not lost to the environment, and keeps growers in regulatory compliance. Enhanced Efficiency Fertilizers, such as N stabilizers, have been shown to improve crop yield in regions like the Midwest and the Northeast, and may help to mitigate N losses to the environment. 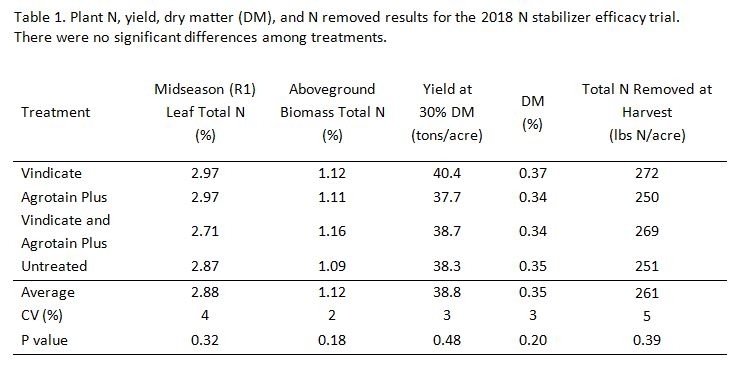 In our trial, we evaluated the efficacy of N stabilizer products for improvements in corn silage yield or plant N status compared to fertilizer alone. Under the management and environmental conditions of this trial, we found no differences in yield or plant N status; however, plant and soil tests indicated that N was not limiting in the trial. If N was lost from the system, the loss was not large enough to result in N limitation in the control. Future study should test these products using different N sources and N rates (e.g. grower rate versus grower rate minus 50 lbs N/acre). It may be possible to reduce the fertilizer N rate without sacrificing yield. This trial was made possible with the generous cooperation of Hank Van Exel and Van Exel Farms; Carl Bannon and Steven Colbert (Corteva Agriscience); Brad Schrenk (Simplot); Eric Ellison (Koch Agronomic Services); Nick Clark and Daniel Geisseler (UCCE); and Shirley Alvarez, Cheryl Gartner, and Dan Rivers (UCCE technicians). An in-depth report is available from my website. Please don't hesitate to contact me with comments or questions.